In the United Kingdom’s (“UK”) portion of the North Sea, our focus is on managing our infrastructure, platform maintenance and mature basin exploitation. This approach ultimately prolongs the life and economic value of our assets. Our resource potential is significant, making the North Sea a low-risk source of high-value, light crude oil. We remain focused on optimizing operations to lower operating costs and target to maximize the value of our development projects and infill drilling opportunities. We operate the vast majority of our fields in the North Sea with a high average working interest, giving us control of our assets. Long-term, our objective for the UK North Sea is to maintain production and proactively manage our abandonment liabilities of this mature asset. Mature field declines will be offset with development projects and infill drilling, provided conditions warrant economic investment. The Ninian, Lyell and Columba fields are located in the Northern North Sea, around 386 km north-northeast of Aberdeen. The Ninian field is comprised of three fixed platforms. The Lyell field is a subsea tie-back with production via subsea manifold to the Ninian South platform. The Columba fields are exploited utilizing extended reach wells drilled from the Ninian South and Central platforms. Oil from all these fields is processed onboard the two platforms and exported to the Sullom Voe Terminal on the Shetland Islands via the Ninian Pipeline System. In 2018, the Company will continue the decommissioning of the Ninian North platform. The Banff and Kyle fields lie approximately 200 miles east of Aberdeen in the Central North Sea, blocks 22/27a and 29/21. The field is operated by CNR International and produced via the leased Petrojarl Banff floating production storage and offtake vessel (FPSO). Crude oil is subsequently stored on the nearby permanently moored shuttle tanker, Apollo Spirit. The CNR International operated Kyle field is tied back to the Banff FPSO. This arrangement and additional volumes of gas available for injection has increased the economic life of the Banff field. 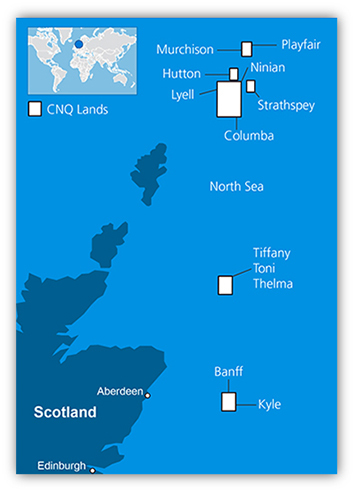 The CNR International owned and operated Murchison field is located in the Northern North Sea Block 211/19, north of Aberdeen in the East Shetland Basin, straddling the United Kingdom/Norwegian sector median line. The decommissioning activities at the Murchison platform commenced in Q4/13, the platform was de-manned in 2016, the top-side was removed in early 2017 and the decommissioning efforts were completed in Q2/17. Often referred to as the “T-Block,” the Tiffany, Toni and Thelma fields are located in the Central North Sea, around 155 miles north east of Aberdeen. Tiffany began first oil in 1993. The Toni and Thelma fields are subsea tie-backs, with production via subsea manifolds to the Tiffany platform. Oil from the fields is exported from the Tiffany platform via a short link to the Brae - Forties oil pipelines and onward to shore at Cruden Bay in North East Scotland. Gas volumes are transported northwards via pipeline to the Brae field for fuel, reinjection and as immediate gas sales.